Main Stage and Almi Hall. Box Office's contact information and opening hours. You can enquire after lost property from our concierge via telephone at (09) 4030 2306. Any belongings left behind are delivered biweekly to the lost property office of Suomen löytötavarapiste. We cannot accept responsibility for our visitors’ personal items. The Main Stage of the FNOB has a capacity of 1300 seats. Thanks to the refurbishment in 2015, the vast majority of seats now offer excellent comfort and views. The raked seating in the stalls, however, means that the Swedish and English subtitles are somewhat obstructed in seats 698–700 and 725–727 on the sides of row 19. Though views from the balconies are generally good, the safety rail can restrict views on the sides of the first row of the second balcony and on the first row of the third balcony. An induction loop system has been installed in the stalls of the Main Stage. You’ll see the seats serviced by the induction loop here. By clicking on the dots of the seating map, you can compare the view of the stage from different sides of the auditorium. You will find the exact seating map with seat numbers via the link above. Almi Hall, the smaller stage of the Finnish National Opera and Ballet, hosts everything from full-length operas to shorter productions for children and guest performances. Depending on the event, Almi Hall has a capacity of 200–500 seats. Almi Hall is named after the long-term leader of the Finnish National Opera, Alfons Almi. Read more about discounts, exchanging your ticket, ticket types and flexible pricing. Opera and ballet souvenirs and gifts are available at the Opera Shop in the Alfons Lobby near the Töölönlahti entrance of the Opera House. The Opera Shop is open Tue to Fri 12.00–19.00, Sat 12.00–18.00 and during performances. Come and shop with us! It’s perfectly fine to show your ticket on your mobile phone screen, and it is not necessary to fold your printed ticket. The ticket will show your seat number and whether your seat is on the left or right side of the auditorium. The entrance to the stalls is down the stairs from the Main Foyer. The first balcony is on the same level as the Main Foyer and the second and third balconies can be reached by lift or stairs. You will find the row numbers at the end of each row and the seat numbers on each seat. 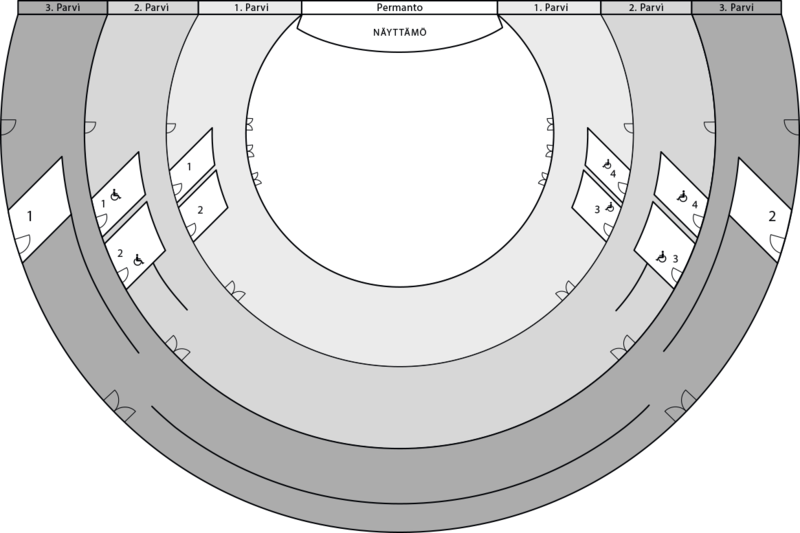 To see exactly where you are seated, you can take a look at the seating plan in advance via the links further up on this page. The doors of the main entrance on the Mannerheimintie side generally open 1.5 hours before a performance in the Main Stage. The Töölönlahti entrance is wheelchair-accessible. The Opera House is well served by public transport, with trams 1, 2, 4, 8 and 10, for instance, stopping right outside the building. The nearest parking is located approximately 100 metres from the Opera House on Mäntymäenkenttä field. Paid parking is available from Monday to Friday until 9 pm, but parking is free later in the evenings and on weekends. The same parking serves the customers of Kisahalli sports hall, the Olympic Stadium and Sonera Stadium, as well as local residents, so it can get very busy. Please allow sufficient time to find a parking spot. For fire safety reasons large backpacks, bags or other sizeable belongings are not allowed in the auditorium. Your ticket includes a free cloakroom service, meaning that you can leave your belongings in our safe hands during the performance. The duration of the interval is 25 minutes. Some performances have two intervals, though most have just one. The interval is included in the total duration of a performance, which varies for each production. You will find the duration of each performance on the production’s dedicated web page. For copyright reasons, taking photos and recording music in our performances is strictly forbidden. Not to worry, however, as you’ll find lovely photos of each production on our website. On the other hand, updating your social media in our foyers is permitted, even very much encouraged! Share the magic moments and tag your photos with @oopperabaletti so we can see them, too. Please arrive in good time. In order to not disrupt the performance, we cannot allow latecomers into the auditorium. Likewise, if you leave the auditorium in the middle of a performance, you can only re-enter after the interval. Should you arrive late, please ask for the concierge in the lobby or foyer to assist you. Some people in the audience will be sensitive to fragrances. Please be mindful of them when putting on perfume.